We made one final attempt to get a race for Charlie. He was entered in extra 3 for Sunday, September 27. The race was a $25,000 claimer going 1 1/16th. As you can see from the entry board, the race only had 3 in it and did not go for Sunday. Many of you have asked, “Where have all the horses gone?” Specifically, Charlie’s competition. If you’ve been following the races, you likely already know the answer, but for the rest of you, I went back and pulled his competition and took a look at where they’ve gone to. 9/13 ran in the Muckleshoot Tribal Classic going 1 1/16, finished 5th and last. A number of items jump out when looking at his competition and that is most of them went down the claiming ladder. Which would make sense since they were unsuccessful at the $25,000 level against Charlie. The other item that jumps out is that those that stayed at the 25K level had to sprint. We all know after our failed first outing with Charlie that he simply is not a sprinter and he requires two turns to be successful. 7/25 – $15K going 1 1/16 miles, did not finish. Horse stumbled, lost rider and hit the inside rail. He was injured and is recovering. Kiss Sin Goodbye – see above. Even from this race there was only one horse that moved up and that was Kiss Sin Goodbye who Charlie saw in his next race. This is also the only horse that has continued to enter the $25K level going long with Charlie. Charlie essentially outran his competition. His competition either remained at the $15,000 claiming level or shortened up to sprints in order to run. If he ran back at the $15,000 level after finishing second for $25,000, we can make a safe assumption that he would have been claimed. And given that Tribal Waters was claimed, we wanted to keep Charlie at a level that he could run at and hopefully not get claimed. So what happens to Charlie now? Those of you that have expressed an interest in continued ownership of Charlie have been connected and we have offered Charlie to this group for $20,000. A fair price given his successful run at the $25,000 level, but a bit less than his last claiming price so this new group of owners can have an opportunity to acquire a good horse and embark on their own ownership. 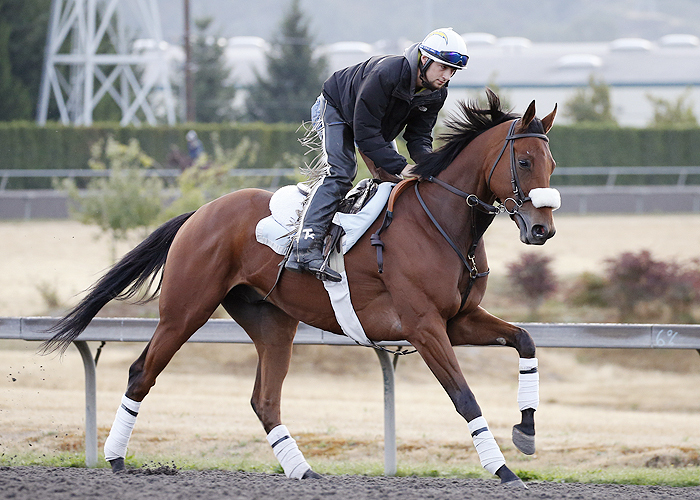 He’s fit and ready to run and should be able to have a good run in California over the winter. The sale is not complete. We are giving this new group time to meet, discuss financials and evaluate their participation. Everyone needs to be comfortable with their expectations and have their questions answered before committing because ownership is a huge personal responsibility. Most important item – Seahawks game WILL BE on one of the big flat screen tvs in the tent. Food served 3 pm – 4 pm. If you’ve RSVP’d (see previous blog), then I’ve got you on my list. I’ll see you there! The fun isn’t over yet. You’ve been personally invited by El Dorado Farms to attend their Open House and Stallion Presentation on Sunday, October 4. Please click here to RSVP for the party. Event is open to ERC member plus two guests so please indicate how many in your party when you RSVP. Races start at 2 pm on Sunday, September 27. Party will take place in the Trackside Tents rain or shine. It may be a little cool, so please dress appropriately. Non-alcoholic beverages and food will be provided. 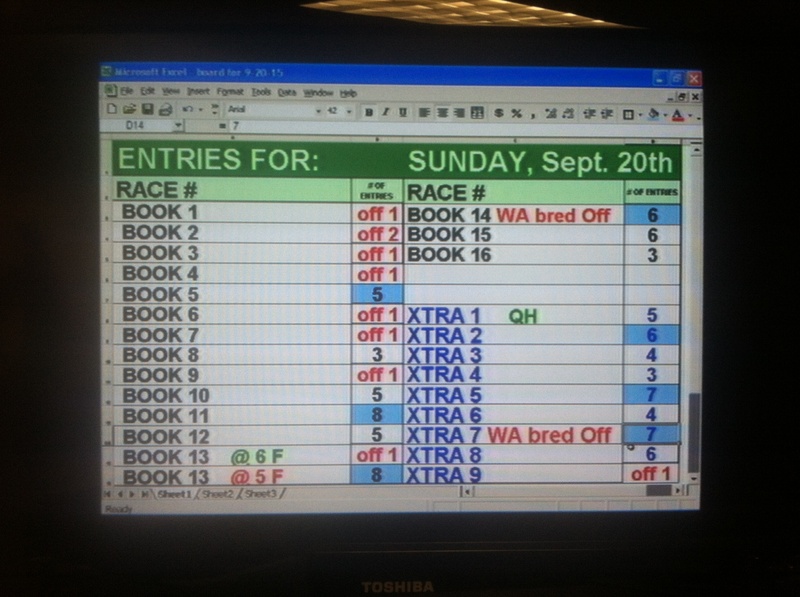 Charlie was entered in “Book 9” for Sunday, September 20. Book 9 was a $25,000 Claiming Race for three year olds and upward going one mile. 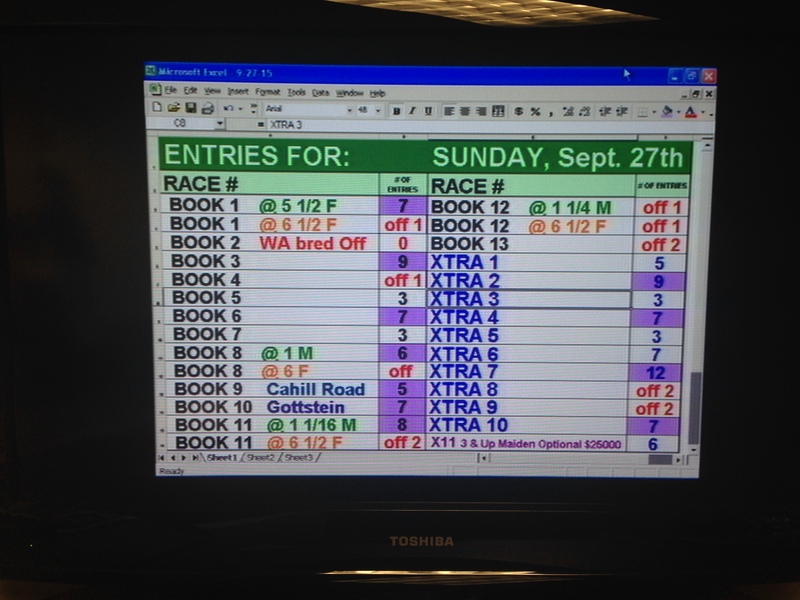 As you can see from the board, only one horse entered (Charlie) and the race was called off. As of now, there are no further races in the condition book for three year olds and upward going long. So unless another extra race is written, Charlie Thomas is done racing for the season. He has been entered every weekend for the past three weekends and unfortunately, the races just didn’t have enough horses to make them go. Charlie Thomas will be sold privately. There is a small spin-off group from the Emerald Racing Club that is interested in purchasing him to continue running in California over the winter. If you are interested and have not yet emailed me, please do so at emeraldracingclub@gmail.com and I’ll put you in contact with the group. The Emerald Racing Club year-end party is set for Sunday, September 27. An RSVP will be posted later this weekend so we can get a count on who can make it. Being a responsible racehorse owner means being responsible for your horse after their career has concluded. In the case of Charlie Thomas, he is fit and ready to continue racing and will be sold for that purpose so we don’t have to face the retirement question. But what if we did? What happens when your horse can no longer race and you need to retire it? Not all horses are suitable for the breeding shed. It is your responsibility as an owner to find the horse a good home, and plan for supporting the horse financially for however long that may take. Often, your trainer can assist in marketing the horse and helping to find it a good home but the ultimate responsibility falls to you – the owner. Buyers are seeking different things when shopping for an off the track Thoroughbred (OTTB). Thoroughbreds can do just about anything, but the biggest demand comes from eventing, hunter/jumpers and dressage. And these buyers want a SOUND horse, meaning a horse without injuries that would prevent it from partaking in the rider’s chosen discipline. If a racehorse continues to race with injuries, their after racing value drops in the eyes of the OTTB buyer. It becomes the responsibility of the owner to decide when the right time is to retire their horse with consideration for their quality of life and ability to continue on in a second career. For that purpose the Prodigious Fund (remember the $5 payment to Thoroughbred Retirement?) is hosting the Thoroughbred Showcase. This is an event to bring together prospective buyers with horses looking for new homes. 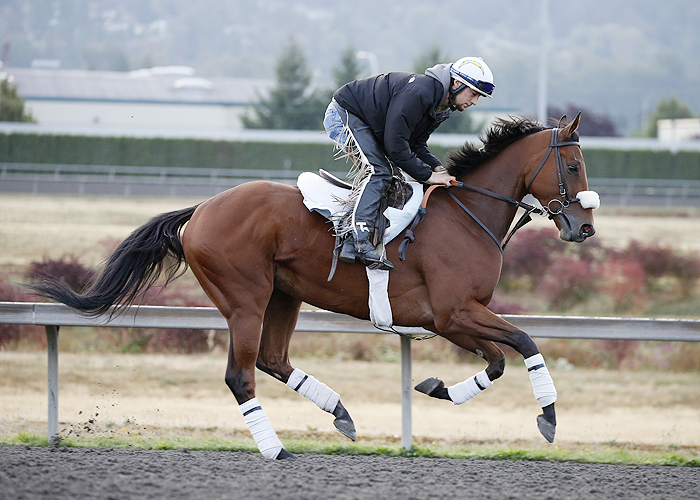 The event is Saturday, September 19 and is held in the temporary stalls at Emerald Downs. We have 27 horses entered in the Showcase and expect 50 prospective buyers to be shopping for their new partner. The event is open to the public and begins at 9 am. (Available horses are posted at www.facebook.com/prodigiousfund). Consider making time to come to the Showcase. You’ll see some familiar names of horses that were running this year, and you’ll even see Starlet of Seattle, who was racing around Griffin Place when we went for farm visits. 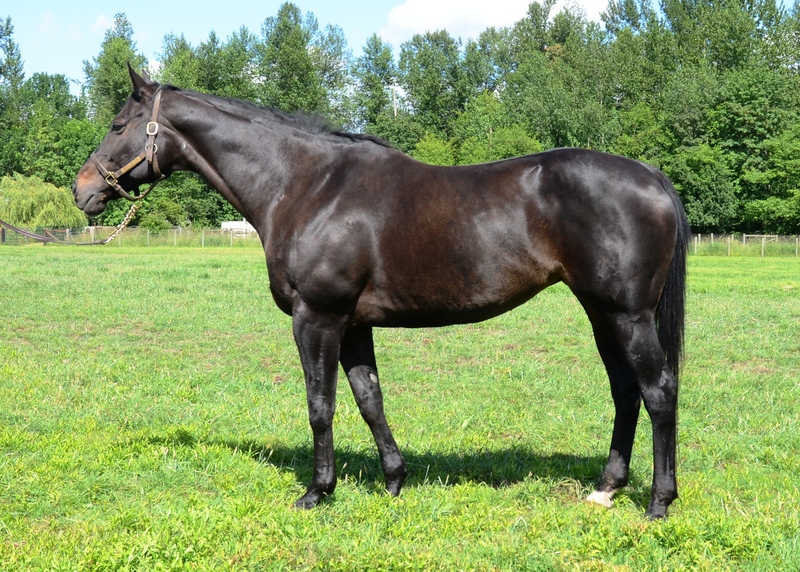 Starlet of Seattle – a 12 year old broodmare ready for a new career. She’ll be available for viewing at the Thoroughbred Showcase. Despite multiple attempts, the races for Charlie did not fill so he will not be racing this weekend. We had the same situation last week when Charlie was entered and he was the only horse entered in his race. Just a note on barn visits – Sharon is going for knee surgery next week so she will not be at the barn in case you were planning to visit. Arturo will be in charge so if you visit, please be respectful of the barn help and know that they may be attending to other things. A reminder to use caution around the horses. Charlie has been getting a bit spoiled and I know he tried to bite after the treats ran out! Save the date for Sunday, September 27 for the Emerald Racing Club year end party in the trackside tents! More details will be forthcoming as it gets closer. The win photo from Tribal Waters last race is available from the track photographer. Contact Erin Palmer 503-380-0430 or stop in the track photographers office. Erin was also able to get some photos of Charlie training this past week. Sharon reports he is training well and ready to run if we can get a race.